You can either enter in a portfolio from scratch, or import one that has been exported from your brokerage house. 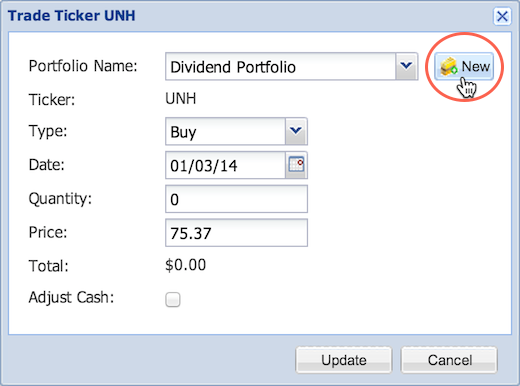 To learn about connecting your Stock Rover portfolio to your brokerage account, see our Brokerage How-To. There are four ways to create a new portfolio: with the Portfolio manager, by trading a stock in the Table, by saving the Table as a portfolio, and by saving all tickers with the same tag as a portfolio. Every time you create a portfolio, you will have the option of selecting a start date for the portfolio, which will allow the Portfolio Analysis facility to track your portfolio’s performance. Note that Basic members can only track simple portfolios without history (portfolios that are simply a list of current positions), while Premium members can add or import a history or portfolio positions or trades. There are two ways to reach the Portfolio Manager. The first way is to use the Start menu, just click ‘Create a Portfolio’ in the Start menu, or search for this item with the search box. 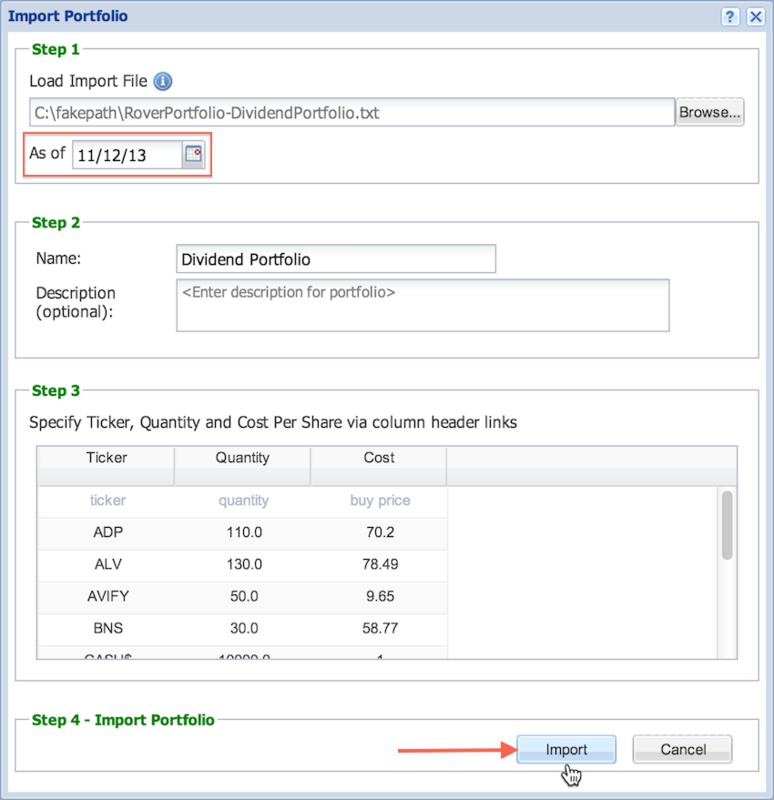 You will be prompted to either enter positions for your portfolio, or to import a portfolio. 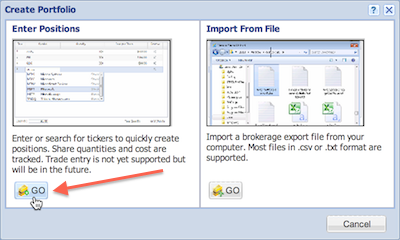 Click the ‘Enter Positions’ on the left, and you will be brought to the Portfolio Manager. 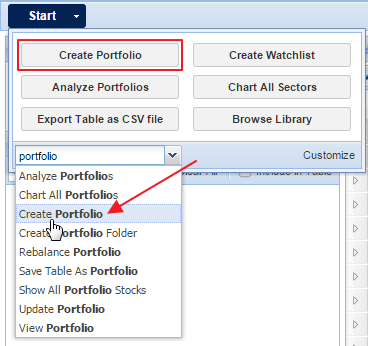 The second way to reach the Portfolio Manager is to right-click on ‘My Portfolios’ in the Navigation panel and select ‘Create’. 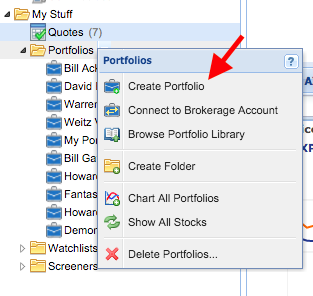 In the manager (shown below), you can edit the name and notes of the portfolio in Step 1. In Step 2, you can add positions or change the ‘Position as of’ date. When you edit positions, you are editing the list of positions on any given date (the date selected where it says ‘Positions as of’). By default, the selected date will be today or the most recent trading day. Change the date to enter positions on a historical date. Each date you enter positions for is called a “date record.” You can then enter in the ticker symbol, a quantity, and cost per share, as well as your cash position. The ‘Price’ column will always show the current price of the ticker (if the start-date is the current date), or the closing price of the ticker on the selected date. See below for an example of this. In Step 3 you can create the portfolio. 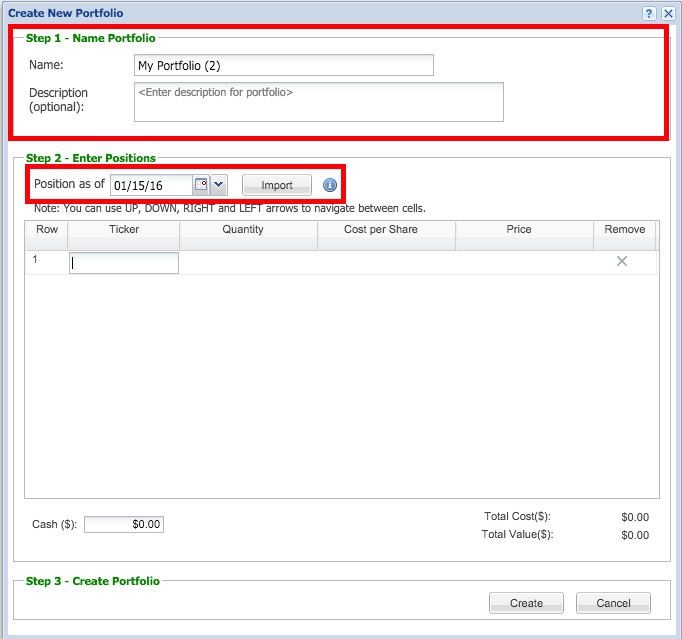 If you want to enter multiple date records, you will first have to create the portfolio after creating one date record by clicking ‘Create’ and then return to the portfolio editor. You can create an equal allocation portfolio by selecting several tickers in the Table and right-clicking to trade in the portfolio. You can choose to “Buy All Equally” in a new portfolio and specify and amount for each ticker. 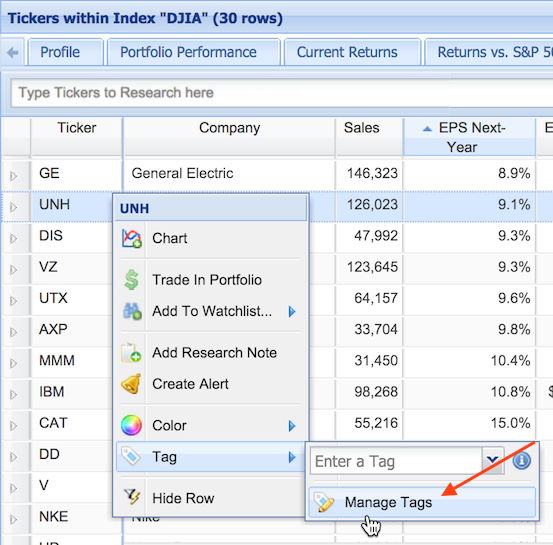 The third way to create a portfolio is by saving all of the stocks listed in the Table as a portfolio. 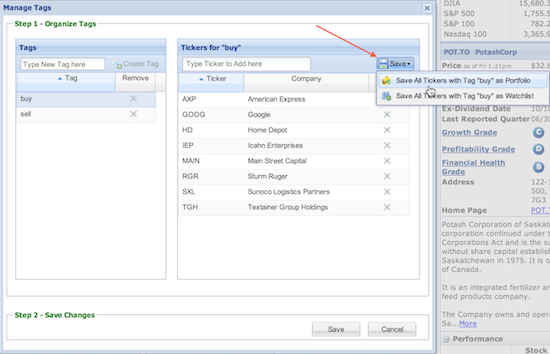 To do this, click the ‘Actions’ button in the Table’s toolbar, mouseover ‘Save’ from the drop-down menu, and choose to save the table as a portfolio. This will bring up the following window, where you can name your portfolio and add a buy date For further editing, follow the ‘Click to Customize’ link, which will bring you to the Portfolio Manager. 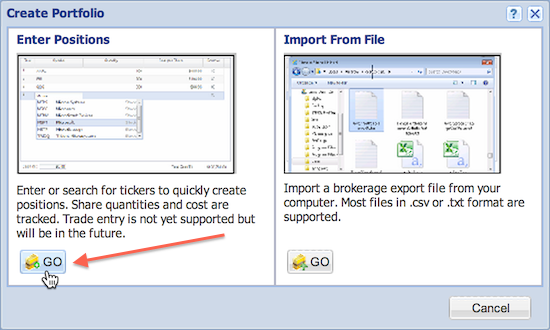 There are a couple of different ways of importing a portfolio that is stored outside of Stock Rover. You can click the ‘Create a Portfolio’ link in the start menu or the right click menu in ‘My Portfolios’, and then select ‘Import a Portfolio’ in the following screen. This will bring up the Portfolio Manager. In Step 1, click ‘Browse’ to navigate to the file that you want to import, and the portfolio as read by Stock Rover will be loaded into the portfolio manager. 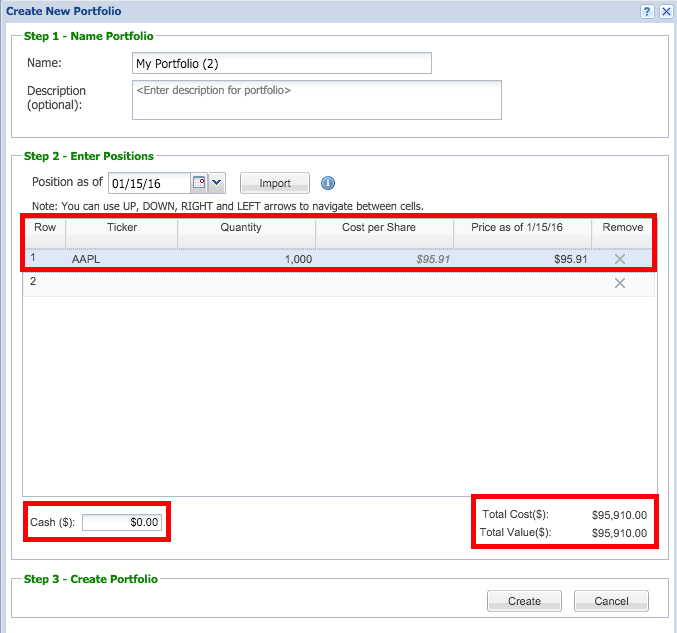 Select an ‘As Of’ date for the start of the portfolio, which will be used to keep track of your historical positions, as well as be utilized in the Portfolio Analysis facility. From here, in Step 2 you can look over the portfolio to ensure it was read correctly, and make any changes as needed. If it was read correctly, click ‘Import’ button in Step 3, and the portfolio will be added under ‘My Portfolios’ in the Navigation panel.